Westlife was a hit Irish Boy Band who dominate our music world in the late 90's and in the early 2000. But did you know that this boy band sings almost all of my lovelife's theme songs? 1999 was the year when they launched their first album with "Swear Again" as their carrier single. And this song was our theme with my first love. I was in third year high school during that time. Their next hits like "If I let You Go", "Seasons in the Sun", "More Than Words", "Fool Again" as well as their other songs in their first album completed my first love story's themes. Then when they launched their second album which was "Coast to Coast", I was already falling inlove with our dancer neighbor. Their carrier hit "My Love" was my theme song for her! And their next song from this album which was "I Lay My Love on You" was my theme song to my saleslady crush in the early part of 2001. Summer of 2001 when I entered college, I found a close friend or a friend of mine who taught me how to dance to the tune of "When You're Looking Like That" captivated my heart! I fell in love with her and that dance song which we danced together was my theme song for her! On the late part of 2001, I was already falling inlove with my co-junior staffer in our college student publication. And one of my theme song for her was "Queen of my Heart" which was the Westlife's hit during that time. 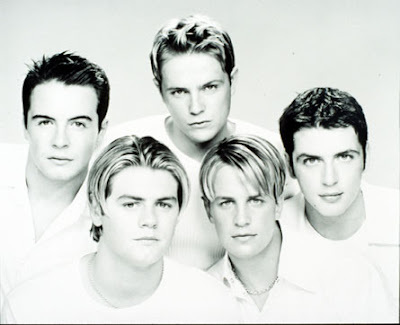 2002 when I was in my second year college, Westlife launched their "World of our Own" album. During that time, I was now having an affair with my classmate who was also a member of our barkada! Yeah we were too close and I was deeply falling inlove with her. But sad that, she dropped her subjects cutting our love story! Westlife's songs in our days which made me remember her were "Bop, Bop Baby", "Evergreen", and the other hit songs from their third album!